Henry Grim is a servant boy at the Midsummer School—until he passes the elite Knightley Academy exam and suddenly finds himself one of the first commoners at the Academy, studying alongside the cleverest and bravest—and most arrogant—young aristocrats in the country. They thwart Henry’s efforts to become a full-fledged Knight of the Realm, but he and two commoner classmates are determined to succeed. In the process, the boys uncover a conspiracy that violates the Hundred Years’ Peace treaty—and could lead to war! 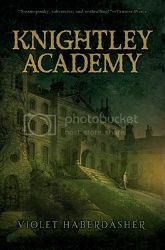 Can Henry manage to save his school and country from their enemies—and continue to study at the Academy? When I first saw this book on someone else’s blog, I didn’t know what to think. The post was a guest post from the author, explaining what “Harry Potter Inspired Novel” meant as the term had been used in describing the book. Basically, she explained, Knightley Academy was what came from having practically grown up reading Harry Potter, and desperately wanting something similar to read next. No wands, no magic, none of that stuff, but still Harry Potter inspired. This explanation made me a little worried. How could anyone even try to compare to Harry Potter? I mean, I read fanfics and all, but I didn’t know what to expect from a novel that wasn’t really fanfic at all. That didn’t stop me from checking it out, of course. The chance that it really was just as great as Harry Potter was too much to pass up. I shouldn’t have worried. From the time I picked up the book, I could hardly put it down. For the first few pages I spent a lot of time just finding the similarities, but before long I was so busy following the story that I didn’t even notice! In fact, by the end of the book, the thing that stood out to me the most was how unlike Harry Potter it was – and yet how I felt so much like I did when I finished a Harry Potter novel. Books always give me a certain feeling, depending on the type of book, and this one was like reading Harry Potter all over again. It was so wonderful to experience that feeling again! It made me wonder why we haven’t seen more of these “Harry Potter Inspired Novels.” There’s plenty of Twilight inspired type novels after all. But possibly the best thing about this novel is that it addresses a very serious issue; prejudice. Henry and the other two “common” boys are accepted to a school that is normally reserved for the rich and important and they are bullied because of it. They aren’t the only case of prejudice either: The neighboring country is trying to liberate themselves from class prejudice, but they aren’t going about it the right way. It certainly makes you think really hard about our belief systems and why we govern ourselves the way we do. In short, this isn’t just a book that is inspired by Harry Potter, it’s a book that is in the best tradition of the Harry Potter story. It is a wonderfully entertaining tale that nods towards its predecessor, but stands on its own two feet with a message that makes you think. Definitely give this one a shot! If you have a moment, I’m still looking for the book in my post earlier this week Missing: HAVE YOU SEEN THIS BOOK? Please help if you can! I never actually got around to read Harry Potter books (well except the first part, but I heard the whole fun starts with the second book), so I wouldn't really know what to expect from this book either. But if I get around to reading HP books in the future I will surely check this one out too!